RAM Clutch Systems for Ford performance cars offer several alternatives for the proper blend of performance and drivability for your application. Not intended for performance/competition, RAM Premium OEM Replacement Clutches offer the best blend of drivability and durability. They utilize the same original equipment as vehicle manufacturers so you get what belongs in the car, not cheap components or imported imitations. Pressure plate, disc, alignment tool, and bearing included unless otherwise noted. Looking for the perfect next-step upgrade for your clutch system? HDX Clutch sets offer a nice increase in holding power up to 450 ft/lbs while retaining an organic friction material for chatter-free engagement. If you are doing a restoration or just need a little better clutch system than stock, HDX sets get the job done. 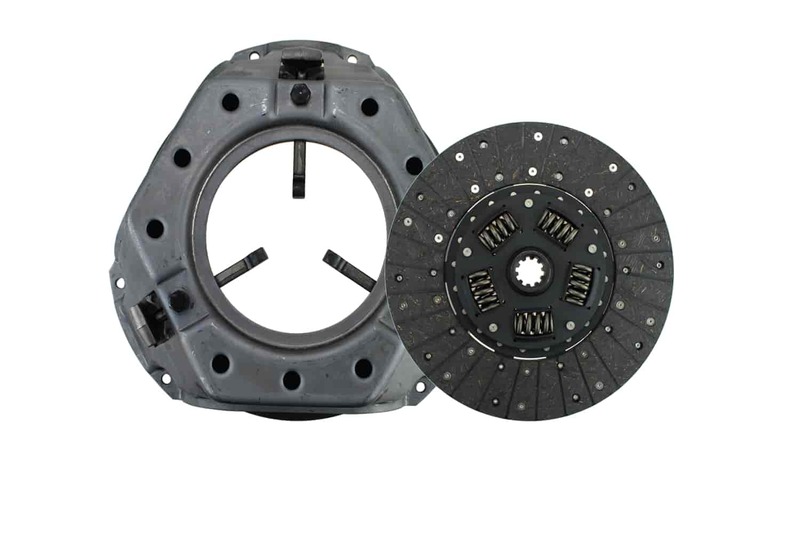 For the ultimate in single-disc clutch sets, Powergrip clutches provide increased clamp loads and holding power without significant changes in drivability. Powergrip Sets utilize dual-sided 900/300 series facing materials for a blend of drivability and holding power up to 550 ft/lbs. For applications up to 650 ft/lbs, Powergrip HD adds a full 900 Series Disc that should only be used on a billet steel or aluminum flywheel. You may experience some chatter at low RPM with Powergrip HD clutches in vehicles with higher (lower numerically) rear gearing. For best performance and safety, match up your Powergrip Set with a RAM billet steel or aluminum flywheel. A dual-disc clutch is not just for high-horsepower applications. The beauty of a dual disc is that you get great holding power with smooth engagement and lower pedal effort. RAM's Force 9.5 is the ideal entry level dual-disc clutch for street use. With a torque capacity of roughly 800 ft/lbs and moderate clamp pressure, these clutches handle small blower or turbo applications and provide a light pedal effort similar to the stock clutch (RAM test drivers couldn't tell the stock clutch was changed). The floater plate is driven from 3 sets of straps to eliminate rattle at idle; the top clutch disc has a sprung hub assembly to absorb the clutch's initial engagement and reduce chatter. Based on the original RAM Street Dual design, the Force 10.5 is more street-friendly with a 3-strap system to locate the floater plate and stop the floater plate rattle that's common to stand-driven dual disc clutches. A high clamp load pressure plate ensures enough holding power to manage about 1100 ft/lbs of torque without excessive pedal pressure. There are two disc series: 300 and 900. The steel-faced 300 Series offers smooth engagement & long service life. The metallic-faced 900 Series is for torque load to about 1300 ft/lbs so expect some floater plate noise at idle. Ideal for larger blower or turbo setups, Force 10.5 Clutches handle more torque & weigh slightly more than their smaller counterparts. This greater inertia translates into better low-speed drivability for heavier vehicles or those with large camshaft profiles. Additionally, starting with a RAM dual-disc clutch will prevent continuous clutch upgrades as you modify your vehicle. Includes RAM billet flywheel. The RTrack Dual is modeled after RAM's highly successful drag racing clutches used in Pro Stock and Pro Mod vehicles. The major difference between these clutches and the Force 10.5 is the floater drive system. RTrack employs a stand-driven floater plate to provide greater torque capacity and negative load for vehicles that see a lot of track time. A 2,400-pound clamp load pressure plate produces good holding power without excessive pedal effort. There are two disc series: 300 and 900. The 300 Series has a sprung hub top disc and solid hub bottom disc for smooth engagement. The 900 Series is for higher torque load up to about 1300 ft/lbs so expect some floater plate noise at idle. Includes RAM billet flywheel.